VIBE is a water based makeup designed for airbrush applications on the face and body. 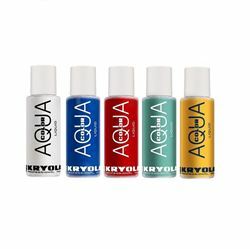 Has a smooth application, intense color coverage, fast drying finish and a soft matte appearance. 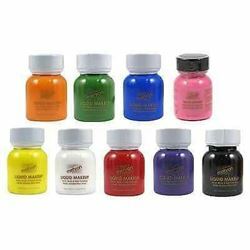 European body art's waterbased VIBE PAINT, in a 6 pack of 1 ounce primary colors. 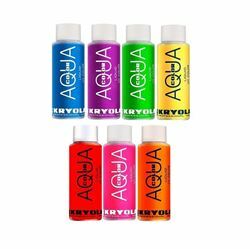 Perfect for anyone new to airbrushing Colors provided in this set are : -BLACK -WHITE -YELLOW - RED -BLUE -GREEN All paints provided are water based. This product is 100% Vegan /Gluten Free/Peanut Free. A 6-pack Sampler Set of NEW Perfect Canvas Highlighters & AirGlow perfect for the pro on-the-go! Set Includes: .25oz Perfect Canvas Highlighter in Champagne, Rose Gold & Copper .25oz Perfect Canvas AirGlow in Warm Glow, Sunset Glow & Amber Glow Perfect Canvas Highlighter enhances skin with a truly natural-looking, light-reflecting radiance and shimmer. This long-wearing, buildable formula lets you create a subtle sheen or capture a more intense, ray of light. Unlike traditional formulas that are too opaque and sit on the sheen or capture a more intense, ray of light. 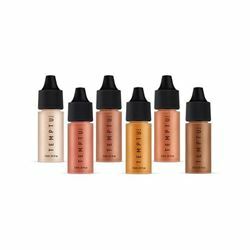 Unlike traditional formulas that are too opaque and sit on the surface of skin, this proprietary airbrush liquid formula features micronized mica that melts into the skin and layers seamlessly for a finish that looks more like a true reflection on skin, not simply makeup sitting on the skin. Champagne: An iridescent pearl color, best for fair-to-tan skin tones Rose Gold: A peachy pink color with rosy gold reflects, best for light-to-dark skin tones Copper: A rich copper color with red and golden pearls, best for medium-to-deep skin tones Airglow: Light Effects for Skin Give skin an inner glow, after glow or all-over glow. TEMPTU Airglow is inspired by the most flattering light effects for the skin – from the warmth of candlelight to the glow of twilight -- TEMPTU Airglow instantly transforms skin with a warm, healthy radiance and a truly ‘lit from within look’. A collection of versatile, universal shades for face and body that give skin the most natural-looking, luminous and radiant glow.